As an online marketer, I have a natural curiosity about using social media sites in creative new ways. Twitter is rife with opportunities to be creative and engage other Twitter users (Twits? Tweeters? Tweeple?) in lively and playful interactions. So if you’re not discovering something new and weird and wonderful every day on Twitter, well, possibly you’re just not wasting as much time there as I am. Also, possibly you didn’t have a friend kind enough (thanks, @tubenerd!) to send you a link to @Sockington, who is moody and demanding and beautifully cat-like in every way. And so today I present to you: highlights of cats on Twitter. Because maybe you’re a cat and you’re looking for other cats to follow, or you’re a marketer looking for inspiration to create a consistent fictitious persona on Twitter. Either way, here are some ways to pull off being a social networking feline. Also, because cats are cute. 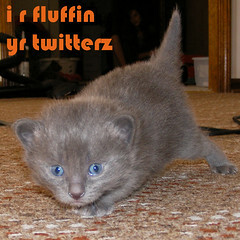 What other cats are fun to follow on Twitter? And besides tweeting cats, what other creative personas have you seen for Twitter? This entry was posted in Twitter and tagged Online Communities, social media & networks, Twitter. Bookmark the permalink. Follow any comments here with the RSS feed for this post. Both comments and trackbacks are currently closed. Thank you, Ms Kate O’ – I have directed my human (Emma) to create a twitter account for me, and I will be following all these wonderful felines that you so thoughtfully found for me. don’t forget about @sockington !